On today’s episode of THE FOOD SEEN, is customizable apron company Hedley & Bennett. 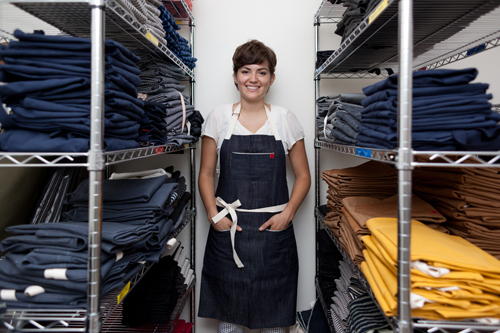 After cooking the line in LA in restaurants Providence and Baco Mercat, Ellen Bennett dreamt up a business that would both benefit and beautify a cook’s uniform for the ages. Handmade in Los Angeles, constructed of American canvas, raw Japanese selvage demin, European linens, Ellen’s aprons had adjustable straps, 1 inch thick webbing to prevent cutting into the wearer’s neck, beautifully constructed brass hardware, and well placed pockets reinforced with bar tacks to avoid ripping, unlike the wear-and-wash, one size fits all kitchen whites often found in the “back of the house”. Now, Hedley & Bennet’s iconic ampersand can be found on the chests of chefs in over 800 restaurants around the world!